Customize your Service Dog ID Kit. Need an extra tag? Patches? Add a premium leash or mobility harness. No problem! Our Service Dog ID Package with dog vest, patches and photo ID clearly identify your service dog anywhere in Canada. We're here around the clock to help. Have a question about your kit? Give us a call, we're happy to help! 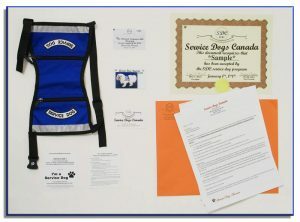 Service Dogs Canada provides the latest in Service Dog equipment, which includes a vest with service dog patches embroidered on each side, wallet card, a collar tag and certificate identifying your dog as a service dog. Your disability qualifies your dog to be a service dog. We supply a service dog identification package, making it easier for you to be in public with your service dog. The term Service Dog encompasses a broad range of assistance animals that have been trained to assist their owners with their disabilities. Canadian Laws requires public and privately owned establishments such as restaurants, hotels, retail stores, taxicabs, airplanes, theaters, concert halls, and sports facilities, to allow people with disabilities to bring their service animals onto business premises in whatever areas customers are generally allowed. SDC recognizes that most persons in Canada may have some form of disability. People with disabilities rely on their dogs to assist them in many different ways. Ensure your dog will be allowed to accompany you wherever you need to go by properly identifying him/her as a service dog with an Identification Package provided by Service Dogs Canada. Having identification on your dog is not mandatory. Our Service Dog package includes quality equipment, vests with embroidered Service Dog patches, documentation, certificates, plastic wallet cards (photo optional), metal collar tags and a booklet of articles with rules and definitions explaining the Laws in simple terms. Our Service Dog package includes quality equipment, vests with embroidered Service Dog patches, documentation, certificates, plastic wallet cards (photo optional), metal collar tags, Department of Justice wallet cards and a booklet of articles with rules and definitions explaining the Americans with Disabilities Act of 1990 in simple terms. There is no restriction of size, breed or age for a service dog. Once the following two requirements are met (the owner has a disability and dog is trained to assist the person) the owner and the service dog may not be denied access to any public facility. With your dog wearing a service dog vest you will always be welcomed. Many individuals rely on their canines to help them in a variety of ways. To ensure that your canine can accompany you wherever you go, it is imperative to properly identify them as a service dog. The dog must behave in public. Service Dogs Canada offers identification packages to ensure your pooch goes wherever you go. At Service Dogs Canada, we want to provide you and your canine everything you need to be accepted in society. Even though it may not be required, we recommend procuring a letter from a physician acknowledging that you are under his or her care for a disability requiring a service dog (we do not need to have a copy of this letter). Under the Human Rights codes of Canada you do not have to disclose your disability to anyone. What does it take for a Dog to Become a Service Dog? There is NO legal requirement for a Service Dog to be trained by a Professional Trainer in order to have "public access" rights. For some reason, Service Dog organizations profess that ONLY dogs professionally trained have public access rights. A person with a disability has the right to train his or her own Service Dog, either with the help of a trainer or without. Once the following two requirements are met (owner has a disability and dog is trained to assist the person) The owner and the service dog may not be denied access to any public facility. 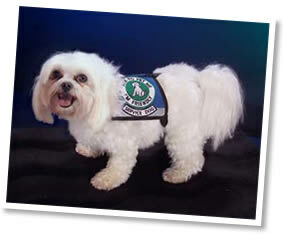 With your dog wearing a service dog vest you will always be welcomed. At Service Dogs Canada, we want to provide you and your canine everything you will ever need to be accepted in society. You will not have any difficulty as long as your dog is trained and behaves. desire to have your dog identified as a service dog. Meet Wrinkle, an owner trained service dog. Complete with vest patches, collar, leash, collar tag, certificate wallet card. Our Service Dogs Canada team maintains a help desk 24/7 (647) 846-7781 for the benefit of our clients. We answer questions and have a network of associates to assist with any situation you may encounter. First of all Paul & Service Dogs Canada provided excellence service , helpful & kind and always there for us. I have had Maya my husky mix as my service dog with Service Dogs Canada for 4 years. I took Maya to Brazil 2014-2015 for 6 months and we just return to USA . We had easy flight on American Airlines we had our own seats, easy entrance through customs into Brazil. Then I brought Maya & border collie puppy back to USA easy entrance with her service dog card & vest. My new puppy Francisco received training under Maya and now he is also a service dog. We are so grateful. Thank you so much Service Dogs Canada. 191: People with disabilities who use service animals to assist them with disability-related needs (such as anxiety) are also protected under the definition of “disability” in section 10 of the Code. Service animals do not have to be trained or certified by a recognized disability-related organization. 191: People with disabilities who use service animals to assist them with disability-related needs (such as anxiety) are also protected under the definition of “disability” in section 10 of the Code. Service animals do not have to be trained or certified by a recognized disability-related organization. Service providers and others who receive such documentation should not use their own assumptions and observations to second-guess this verification.